Education: B.S in Civil Engineering and M.S. in Civil Engineering/Transportation from University of California, Berkeley; continuing education courses in theology at Graduate Theological Union, Berkeley. Current Ministry: Dominican University of California Campus Minister where she promotes the Dominican heritage and ideals of reflection, service, community and study and facilitates interfaith spiritual engagement and development of students and staff. 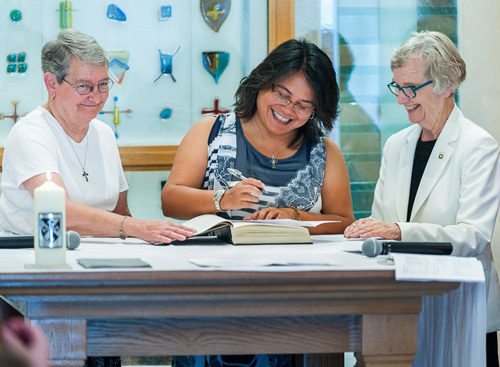 Sister Christina made her First Profession of Vows on Aug. 9, the day after the Feast of St. Dominic, having completed a year as a candidate, a year as at the Collaborative Dominican Novitiate, and a year of ministry. It was a beautiful day for a joyous celebration of Mass and Sister Christina’s first profession of vows. She was surrounded by family, friends, colleagues and her Dominican sisters.